Welcome to the MyCycleTour blog. This page is delivered through Google Blogger. To comment on any of the posts you need to separately authenticate through Google or other publicly available methods provided by Google. Use the link at the top of the page to return to the MyCycleTour home page. I just got back from a two week trip in France with my brother, Chris, and long time friend, Stan. We shared in planning the route using MyCycleTour (http://www.mycycletour.com/displayroute.php?RouteNumber=79) and flew into Bordeaux in early September to start the trip. We assembled bikes at the airport then launched ourselves into the morning rush hour, zipping through roundabouts and busy side streets. This was Stan's inaugural bike trip, and one of the first things he picked up on was the importance of good navigation. As a group we had no shortage of tools. Chris brought paper maps, Stan brought his Android device with a solid GPS app, and I brought my Garmin Edge 800 and a variety of IOS GPS navigation and mapping apps. Yes - overkill, but I was keen on trying out first hand what worked the best. Let's start with the Garmin Edge 800. 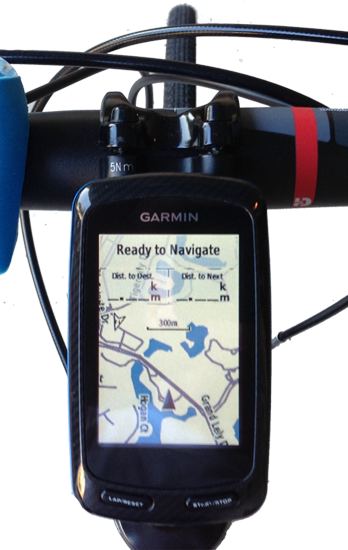 This is one of the best purpose built cycling GPS devices out there and is priced accordingly. In addition to the North America map that came with my device I also purchased the Europe map at added cost. I've taken it on a few trips now and it is a solid work horse for navigation. I'd like it better if it provided spoken turn-by-turn directions and if the display were just a little larger. Like most GPS devices it doesn't always seem to select the most direct path to your destination. Having said that, mine has been robust, waterproof, easily mounts to the bike, has good battery life and loads GPX route files from MyCycleTour. It also has all the bells and whistles of the most sophisticated bike computers and stores route and performance information for your rides. I have to admit, I bought my Edge before the world was filled with GPS navigation apps for smartphones. I like apps that support offline maps, i.e. do not rely on an active data connection to update the map as you move along. Why - because I don't like wasting data minutes, especially when I'm roaming. These apps can easily chew up hundreds of dollars or more in data roaming. Apps that rely on open standard maps (Open Street Maps - OSM) tend to be inexpensive, usually under $5, the others tend to be considerably more expensive, $50 to $100 or more. You'll likely want a USB battery to augment the charge on your smartphone if you bike more than three or four hours a day. 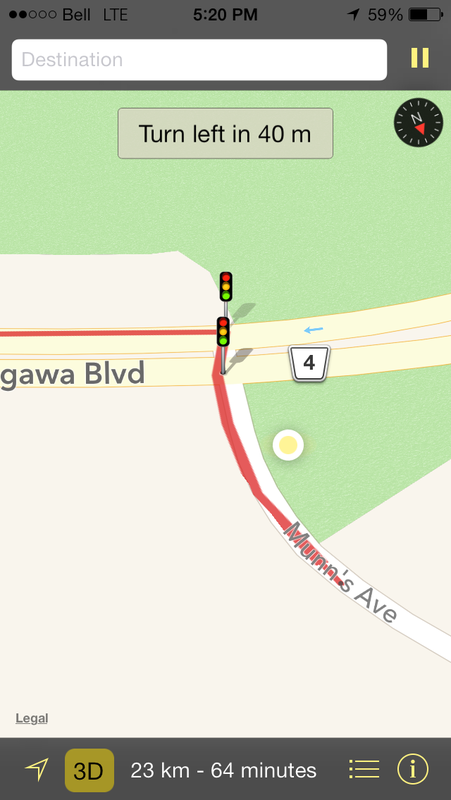 OsmAnd (Open Street Maps Automated Navigation Directions) runs on Android and Blackberry, but not on IOS. Too bad! There is a free version that allows you to load up to ten maps tiles, and a paid version (well under $10) without restrictions. It loads Open Street Maps so navigates when your device is offline (so you can avoid ridiculous roaming data charges). It gives turn-by-turn spoken directions that you can actually hear, calculates navigation routes for bicycles, and even loads routes from GPX files that you can get from MyCycleTour. We tried it, and it works. This was the best of the GPS apps that we tried. Stan rode with this device tucked into his bike shirt with the display normally off. The voice prompt was loud enough to be easily heard, and the battery life was pretty good. This is my favorite smartphone navigation app! I went on this trip with a variety of navigation IOS apps for my iPhone. Why, because I really couldn't find one that I loved. The most functional app that I tried was Co-Rider. It is not supported on Android devices, at least not yet. It provides turn-by-turn spoken and textual directions, supports loading GPX routes from MyCycleTour, but unfortunately does not support offline maps at this time. If you are tripping in your home country and have a good data plan, then this may not be a big issue and this app may be good for you. Unlike some of the other bike specific apps, it also doesn't give typical bike-computer displays, like speed and direction. If you already have a computer on your bike then that's likely not an issue. This one is worth trying. GPS Nav 2 appears to have many of the right elements, but seems to fall short of putting them all together. It allows for downloading offline maps, but unfortunately does charge for them. Pretty reasonably priced, but not free like most apps that download similar OSM maps. It has a nice navigation interface with turn-by-turn directions, but I could only get it to navigate based on routes for cars and not bikes. What's odd is that it does provide the ability to create a bike route and display it on a map, but I could not get it to navigate these routes. I did send an email requesting a little more information but no reply yet. If I get a positive response I will certainly update this comment. I think this app has promise, but it wasn't quite up to my needs at this point. There are a variety of apps that are capable of showing maps, downloading GPX files of planned routes, and displaying a current location. This includes Cyclemeter, B.iCycle, MotionX GPS and iPlanMyRoute. 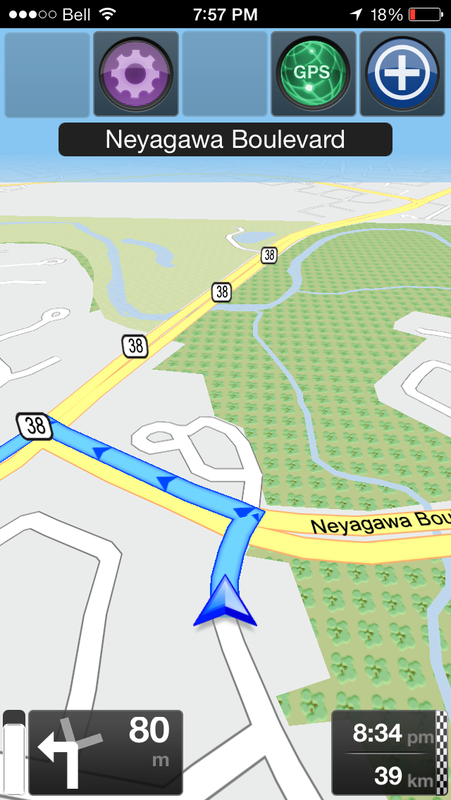 Interesting apps that can be useful if you don't mind missing the turn-by-turn directions. Personally I love turn-by-turn spoken directions. Why? Because I like to keep my eyes on the road and not on my device, especially when riding in busy areas. Keep in mind that some of these apps are really more for performance training than navigation, but they are still worth a look. There are a few others in the $50-$100 range like Navigon and Sygic that support both IOS and Android devices. I didn't try them out, but if you have I'd love to hear your opinions. Leave a comment on this blog. In summary, on this trip we relied primarily on my Garmin Edge 800 but also heavily used the Android based OsmAnd app for navigation. If there was a conflict between the two I would often pull out my iPhone and open up PocketEarth (previous blog) which gave a really good big-picture view of where we were and where we were going. Paper maps? Didn't really need them at all. Would love to hear your comments and experiences! Check your map application that it uses GPS based navigation. This does not use your data plan. Copyright 2013 MyCycleTour. Simple theme. Powered by Blogger.